President Recep Tayyip Erdoğan held a phone call late Wednesday with his U.S. counterpart Donald J. Trump to discuss Operation Olive Branch in Syria's Afrin, which was launched against YPG and Daesh terrorists. In the phone call, Erdoğan reiterated Turkey's determination to clear its southern border of all terrorists. Erdoğan also underlined that the operation is being carried out under the framework of Turkey's rights based on international law, U.N. Security Council resolutions, its right to self-defense under the U.N. charter and respect for Syria's territorial integrity, sources said. The Turkish president also told Trump that the U.S. must stop aiding terrorists in the region and do this as soon as possible. Official sources also said that the White House readout does not reflect the nature of the call. 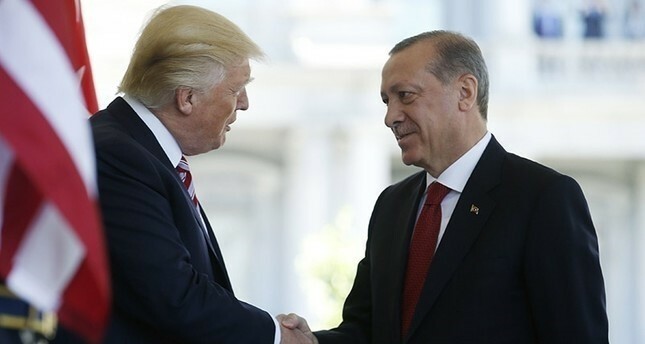 Sources added that Trump told Erdoğan the U.S. is not supplying any weaponry to the YPG at the moment, and will not supply from now on. Denying the readout which alleged the U.S. President expressed concerns about "destructive and false rhetoric coming from Turkey," sources stated that Trump did not utter the words, but expressed discomfort over criticisms directed at the U.S. The phone call was held upon the request of the American side, presidential sources added. Operation Olive Branch was launched Saturday, targeting the PKK terror group's Syrian affiliates the Democratic Union Party (PYD) and its armed wing the People's Protection Units (YPG) supported by the United States, as well as the remaining Daesh elements in Afrin region on the Turkish-Syrian border. According to the Turkish General Staff, the operation aims to establish security and stability along Turkish borders and the region as well as protect Syrian people from the oppression and cruelty of terrorists.